I ordered a rare takeaway last week, having spent 2 days gutting and cleaning my school-holidays-ravaged house from top to bottom, exhausted, and unwilling to mess up my kitchen having spent 17 hours in a pair of marigolds and mostly on my knees. They had a fairly decent range for us herbivores, but I found myself hankering after a shashlik. 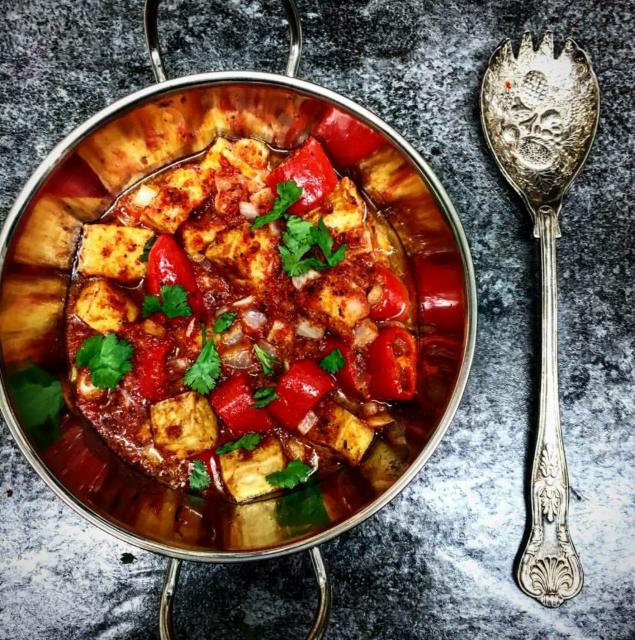 Shashlik is usually skewered meat cooked in spices before being blasted in a tandoori oven, and having neither a tandoori nor any inclination to nibble on a duck or a lamb, I started to ponder how I could make a reasonably authentic veggie version. Mushrooms were out, aubergine would probably be okay but not quite what I wanted, and then I landed on the reduced tofu in Tesco. Bingo. The tofu shashlik was born. I posted it on Twitter and hundreds of you asked for the recipe, so here it is. As usual, prices are based on Sainsbury’s Basics, but other supermarkets offer similar products at competitive prices. If you know of any real bargains, do let me (and everyone else!) know in the comments below. First peel and slide your onion, and peel and roughly chop your garlic and ginger, and toss it into a saucepan with a splash of oil. Add the spices, and cook on a medium heat for a few minutes to start to soften. Pour in the tomatoes and add the peppers, stir well, and transfer to a back burner on a low heat to cook. This forms the sauce for the shashlik, and will benefit from the longest possible cooking time you can bear to give it. I do mine for around an hour, but not everyone’s budgets and patience will stretch to that, so fifteen minutes is just fine. When the sauce is thickened and smells delicious, you can start to cook your tofu. When I first posted about this recipe, I was inundated with requests from people, especially about how to make tofu crispy. I’m no expert, as it is a new ingredient to me, but have just about managed to pull it off by now. First you make sure all of the excess water is gently squeezed out, similar to how you would gently squeeze a mozzarella ball or similar. I do this one of two ways- either place it in a sieve over the sink with a side plate over the top, and pop a can or two of beans on top of the plate. The weighted pressure pushes the liquid out of the tofu and down the sink (in the interests of improved frugality, if anyone has a use for this, I am all ears.) Or, I wrap it several times in a clean flat tea towel and gently press it between my hands over the sink, where the tea towel will absorb a good deal of the liquid. Either way, use ‘firm’ tofu, and give it a squish. Dice your tofu as fine or as chunky as you like, and pop it in a bowl with some flour and a pinch of salt. Give it a shake to coat it and slightly rough up the edges, important for the crisp factor as dishevelled edges cook faster than clean and tidy Stepford Wife ones. This is the secret to perfect roast potatoes too, is to throw them around a bit. Gently grease a frying pan with a little oil. Bring it to a high heat to warm the pan, and carefully put your tofu in. Cook for a few minutes, then turn the tofu over to cook it on the other side. A cube has six sides, remember, so there is going to be some serious turning over to do if you are determined to have the crispiest tofu in all the land. When crisp as you like, remove and pop it in the pan of sauce sitting on the back of the stove. Give it a quick stir, garnish with some greenery if you are cooking it for someone special (that can be you, you are special) and enjoy. Thanks for the tip. I’m always put off using it because of the texture. Will try this one out. Do you think it would work with gram flour? Jack: thanks once again for all the amazing recipes. This one looks great. Could you explain your comment about the “secret to perfect roast potatoes” a little more. Are you dusting them in flour and salt too? I usually peel and cut mine but then just throw them in the roasting pan with a little oil. Thanks. Sounds delicious! I’ve heard the liquid drained from tofu can be used similar to the liquid drained from chickpeas, aka aquafaba, but I don’t know a whole bunch about either of those. “that can be you, you are special” – what a line, and what a wonderful world-view! Thank you for reminding me, Jack. Yummy I will try this for sure so glad you are back with your great recipes. Also nothing beats tidying up ,cleaning, and re-arranging and getting rid of stuff one does not need in the kitchen especially! That sounds yummy. I’ll certainly give it a try. Thank you. I love your recipes and they help with the bank balance. .you are a wonder. Bog hug to you and boy. Hi, I’ll try this tonight with your tarka dall recipe and maybe an aloo gobi to go with it. Looks greaT. I oven bake tofu with soy sauce to firm it up for other dishes and use the water in my home made stock with all the ends of onions and broccoli stalks etc. Yum for gravies and soup bases. I’m going to try this with Quorn pieces. Asian supermarkets often do cheaper – and tastier, creamier – tofu, if you have one nearby. I tried this recipe last night and absolutely loved it. Just had it with a little rice. There’s enough left over for tonight as well. Very easy to make. Even the fried tofu turned out fine. Will definitely be making this one again and again. Thank you! Ooh, never thought to do this with tofu! Thanks, now I know what I’m having for dinner tonight. I’ve found if you freeze tofu, then thaw it out before squeezing it then it ends up firmer and crispier. Maybe it’s just the brand I buy but it works. Oh no!!! coriander and cumin ? can’t stand both as allergic to coriander. still going to try this one taking those ingredients out! I made this tonight, and served with skin on wedges, some broad beans that I had in the freezer and some cavolo Nero and kale I had that needed using. I’m a sucker for never ever following a recipe to a T though (sorry Jack!) so although I’m sure the original recipe was still just as good I added a couple of cap fulls of red wine (vegan of course! And also it needs using! 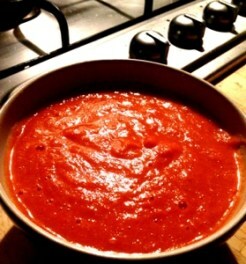 )a glug of balsamic, pinch of veggie stock and a tin of ratatouille I bought reduced for 13p! With the changes I reckon I have 6 portions there so not much more cost – and mine is cut because I also make my own tofu from home made soya milk ? probably costs me less than £1 to make a block the same size as the cauldron ones ?